What happens when you take a white pro basketball player, who is forced into early retirement due to an injury, and stick him in the head coach position at a predominantly black high school in South Central L.A.? Why, The White Shadow, naturally! A long-time AD syndicated favorite, The White Shadow aired on CBS from 1978-1981 and boasted this funky mess, below, in the opening credits. Sidenote: This one is just begging for the big screen treatment. 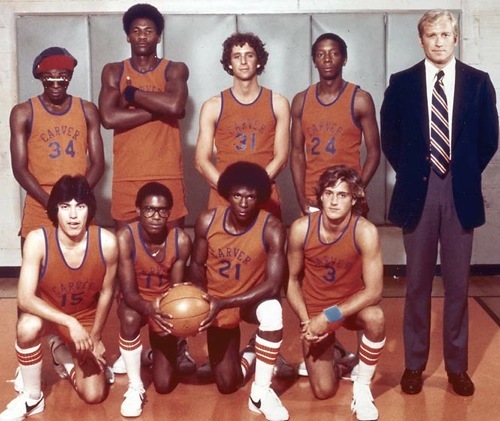 Hollywood, what do you think of Josh Lucas – (basically) reprising his Glory Road character – throwing on some tube socks as the Shadow’s coach Ken Reeves? Another great TV theme music post! This one used to make me run around the living room playing air basketball every time it came on. I love the sorta honky tonk guitar mixed with the slap bass mid-way through. Wow, just barely remember that one. How about Barney Miller’s music? I’d love to hear that one in its entirety.